With their generous dimensions, wide-span racks are ideal for storing long and voluminous goods in a secure, well organised manner. 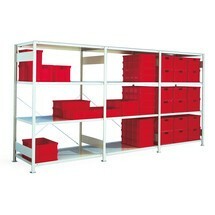 You can also expand the racks with add-on units at any time to adapt them to your requirements. Is your warehouse full of goods that take up a lot of space or are too large for conventional storage racks? In that case, a wide-span rack with chipboard shelves will provide you with the necessary space and stability. This boltless wide-span rack represents a highly functional shelving system to satisfy exacting industrial storage requirements. 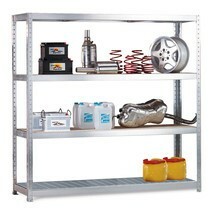 The steel panel shelves offer lasting support for a wide range of materials. 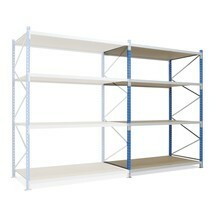 This wide-span rack base unit with steel panels is ideal for storing long and large-volume goods. The shelf rack is erected and expanded entirely without tools thanks to the simple boltless assembly system. Storage of large-volume items and bulky goods could not be simpler – a double-sided wide-span rack base unit represents the first step towards an easily manageable storage system. Boltless assembly allows you to create a custom shelving system. 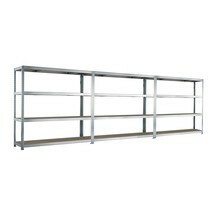 The steel panel META wide-span rack is a real all-rounder offering maximum flexibility. It provides ideal storage for large, bulky and heavy articles with its generous dimensions. If you are looking for a convenient, space-saving storage solution for bulky goods, the META wide-span rack with chipboard shelves is the product for you. The rack is characterised by its solid construction, making it equally at home in industrial, trade and retail environments. A META wide-span rack is ideal for storing all your oversized and heavy goods. You can also expand the base unit at any time with matching add-on units, thereby adapting it to changing space and storage conditions. 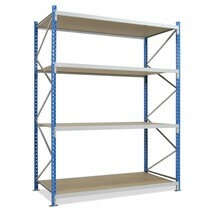 META shelving systems combine maximum storage space with minimum assembly effort. The shelves are assembled entirely without bolts. In addition, the high-quality finish ensures a long service life. This base unit for META wide-span racks offers stability, flexible application and reliable long-term use. The shelves and the frame supports are galvanised to protect against corrosion. A galvanised META wide-span rack with steel panels offers a range of storage options for trade and industrial operations. The shelves can accommodate even the most bulky parts and voluminous containers. 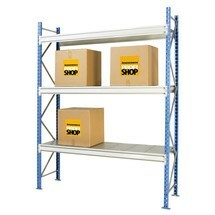 The single-row META wide-span rack is ideal for storing bulky goods and containers with European standard dimensions. The high-capacity rack combines utmost stability with impressive strength, making it the perfect storage solution for bulky goods. When expanding warehouses and store rooms, it is important to make optimum use of the available space. With this double-row, galvanised META wide-span rack base unit, you can create versatile and flexible shelving systems in a flash. Do you require an effective rack system for bulky and voluminous goods? The META wide-span rack base unit serves as the foundation for a user-friendly storage system for your bulky goods, with the freedom to expand at any time. With a flexible rack system you can easily expand your available storage capacity. Supplement your wide-span racks with an add-on unit with chipboard shelves to create additional storage space in a flash. Do you frequently find yourself dealing with changing capacity utilisation in your warehouse? Then you will definitely benefit from a professional rack system, with which you can easily expand your wide-span rack by adding a matching add-on unit.